To arrive at any reasonable estimate of the composition of even the lunar crust is difficult to impossible. To begin with we have randomly collected samples from compacted breccias from only six small areas and we have to recall that little progress was made on understanding the oceanic basalts until we had more than 10,000 analysed samples. The older light coloured high lying areas appear to be mainly formed of a very calcic anorthosite (or seem to be in two tiny areas) which it has been supposed, were a differentiate of the primary magmatic ocean formed when the moon first coalesced and melted in the heat of compaction of solid or semi solid fragments. At about 3byr bp there appears to have been a later resurgence of large meteor infall, which smashed up and remelted much of the older crust forming the dark Maria which can be seen by the naked eye. Large scale impact melting has not been observed on earth but as kinetic energy is converted in a few seconds to heat it should be possible, given the latent heat of fusion of basalt, to calculate how much basalt could be formed by an incoming thousand tons of chondrite, another good class exercise. We can speculate that the impact melts would not be total rock especially of a rock containing high T anorthite, and that at depth at least and perhaps marginally, lower temperature fractions might be formed. 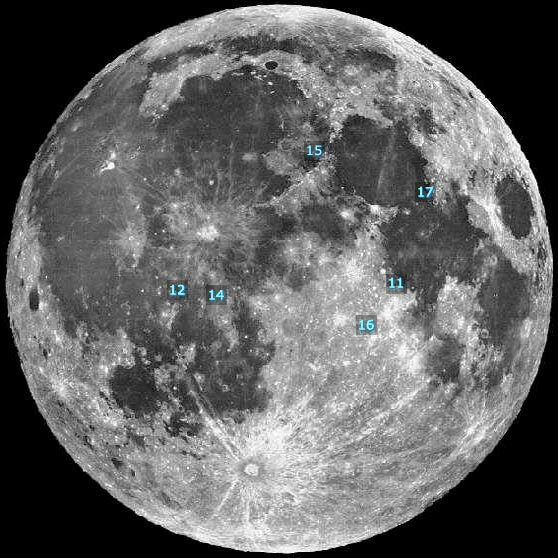 Detailed lunar map here. Unfortunately when seen through a telescope the image is inverted from that seen when using binoculars, so lunar images are often shown upside down and the view from the northern hemisphere is inverted when seen from the south. Let us assume an orientation as seen here where the circular Mare Crisium is to the top-right with Mare Serenitatus to its left followed by Tranqilitatus, the site of Apollo 11. 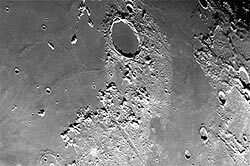 The great mass of the Oceanus Procellarum then lies below and left of centre with Mare Imbrium overlapping somewhat above and left of centre and from the site of Apollo 15. 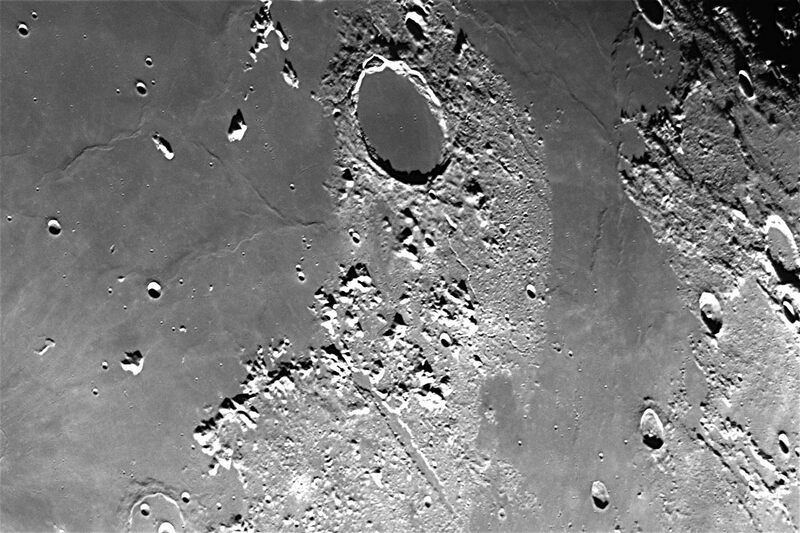 Mare Nubium also overlaps near bottom with Humorum lower left above the rayed Tycho centre. A black band of Mare Figorus lies above left centre and apart from Mare Imbrium. 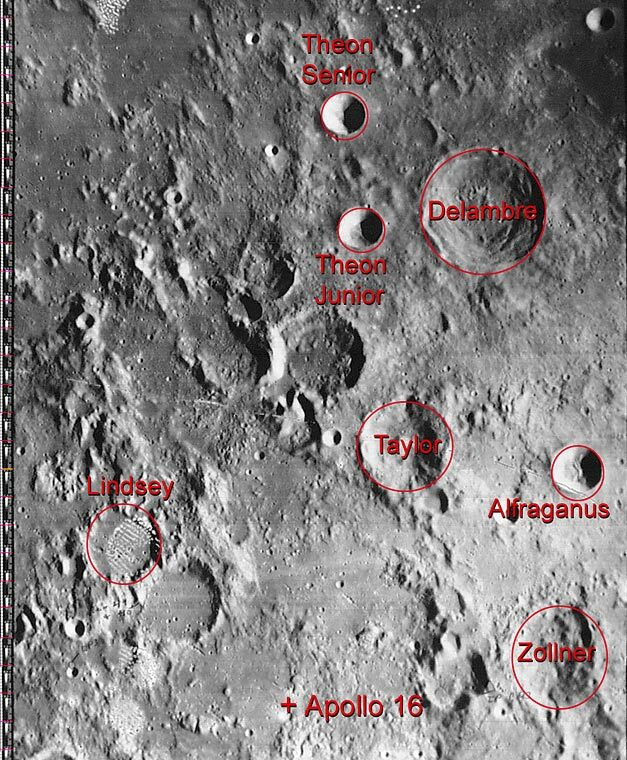 Above the Apollo 12 and 14 sites is the Copernicus crater, also one of the younger impact craters though not rayed as prominently as Tycho. 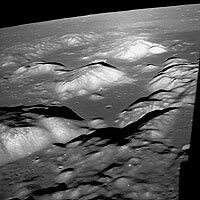 These are the main masses of flood basalt on the moon. Only very minor basalt areas occur on the far side, it seems meteorites were attracted by the larger mass of the Earth but missed and went on to crash into the Moon. One wonders how many hit the Earth in that period. The many younger craters are sometimes impacted on the basalt lava Maria. 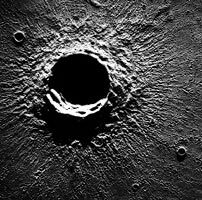 We see a range of structures in the smaller craters of 10 - 200 km size. Those less than about 50 km diameter, (NASA seldom provides a scale) are hemispherical in shape with little subsequent distortion. Those of about 100km diameter are deeper, show collapsed marginal wall scarps, and an uneven floor of back-fallen impactite. The larger craters of this type show rebound peak in the middle. 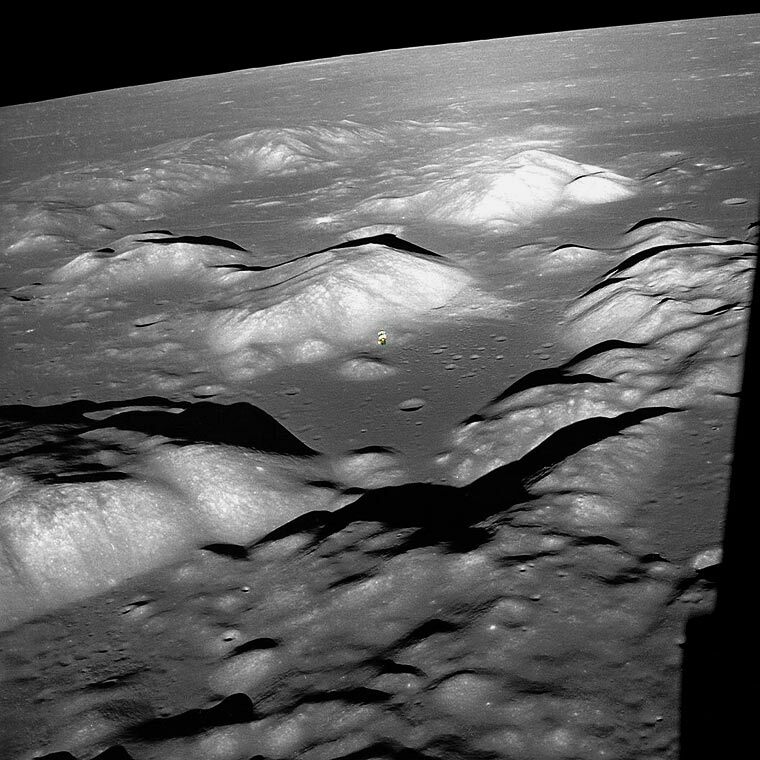 Craters of ~200km diameter show collected pools of shock-melted basalt, sometimes with the central peak showing through, eg Eratosthenes, Tycho. Copernicus which is the conspicuous rayed crater at 20 deg lower left of centre in the Oceanus Procellerum has a raised central impact peak with some impact basalt. 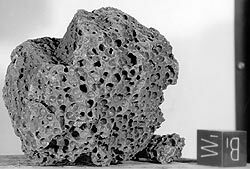 This is interesting because it is shockmelted basalt of the Oceanus Procellarum crust which is itself shock-melted but of unknown parentage. The crater Plato which lies near the Mare Imbrium a little above left centre of the moon is a flat pool of shock melted basalt and surrounded by the usual raised rim of ejected impactite. Only a handful of small younger impacts mar the surface, but due to the low resolution of NASA pix it is not possible to say how many. It appears to have the thinnest regolith covering known but we have no idea what this may be. Cores taken about 2m long in Apollo-15 showed over 50 varied layers from successive impact events and it is possible that near the boundaries of, say, Mare Imbrium, the regolith could be kilometres thick. There seems to be no positive record of massive basalt being uncovered in any of the Apollo landings, even the bases of minor craters 50  100ft deep seems to have exposed only old impactite. On the right we have the impact crater Plato in the border between Mare Imbrium> left and the band of Figorus on right. The Montes Alps below Plato are obviously high but are they of old crustal anorthosite or are they the ridged up remnant of ancient impact crater rims? I do not think this is known, but probably they were heaped up by the Mare Imbrium event. There is no sign of orogenesis or even block faulting on the moon and in the absense of fluviatle erosion only impact disruption can form mountains. A prominent rent valley (lower middle) is interesting because while filled with regolith, it shows signs (on some pix) of being reactivated, possibly by the Plato impact. In the major Mare including Imbrium older craters have been invaded and almost submerged by the flood basalt, so the basalts of Oceanus Procellarum may be at least 2 km deep, possibly much more, a hundred km is not impossible. Based on such a view as this we might plan a sample collecting expedition as follows. Firstly we would want to know what is the composition of the Alps, are they primary planetary surface, or anorthosites or impact breccias? Then what is the composition of the Oceanus Procellarum flood basalts, (and possibly those of the Figorus as well). Even if there is a moderately thick regolith cover, the floors of small carters should show the original surface. Then are the Plato impact basalts the same as those of the Oceanus? If so we can infer they were derived from the same rocks. Then we need to find a crater such as Copernicus to find whether an impact melt of an impact melt has the same or different compositions. Impact melts MAY be total melts or they may be lower T, high P fractionates. I do not think we have any ideas about this at present. And they would be quite difficult to form experimentally though not impossible. We would also want to know whether any regolith overlies the floor of Plato, Apollo 12 and 14 showed there was a great deal on Oceanus. It seem the most urgent tool needed on the moon is a decent backhoe. 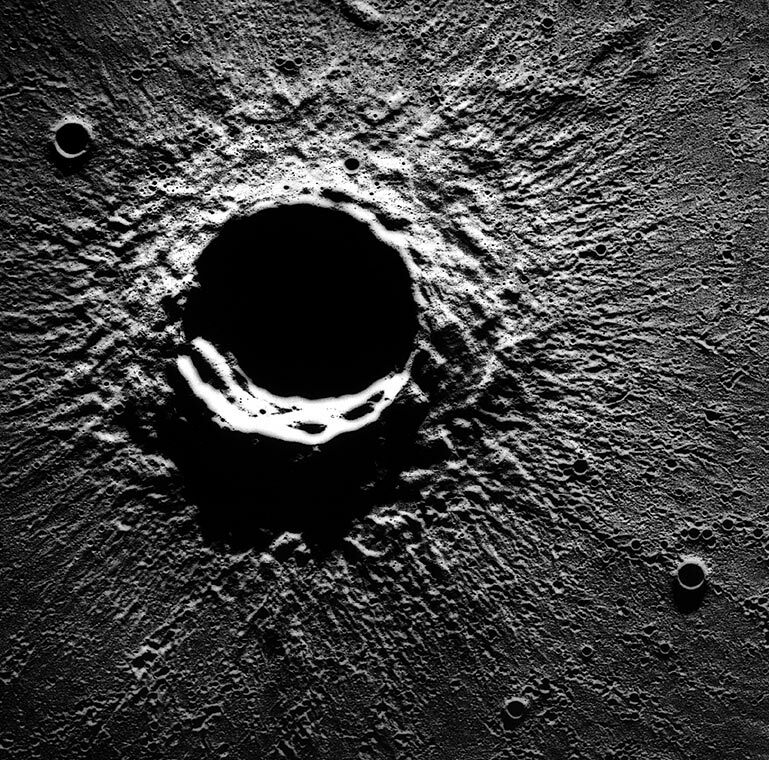 One day we my sink a drill hole a few thousand feet through the basaltic floor of Plato and we may learn a great deal, as it is, the high Ti rocks of Apollo-12 may simply be the result of the conditions of impact melt. Notice the dominant structural lineation leading from lower right to top left in the illustration above. At one point in history, my very efficient secretary contacted NASA and suggested I should have a meeting with the Apollo astronauts to discuss what might be found, what to look for and how to get it. At that point we did not anticipate anorthosites but everything else is pretty much as expected except for the high Ti in some rocks and the very low soda. She was the most charming of persons but I happened hear her raised voice in the course of the conversation "But isn't that pretty stupid of you?" She had been told that no time had been allocated and there was no need! I still wonder if the later Astronauts could have landed on Oceanus and driven the moon buggy down onto Plato, (and got back!) Instead we see below where some of the Apollo missions landed. 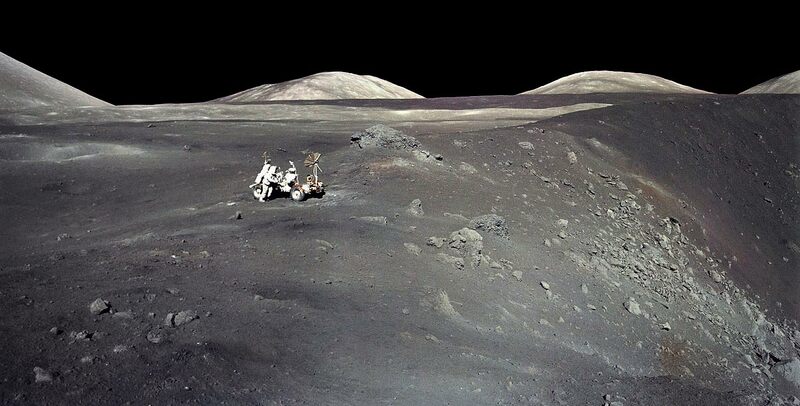 << Apollo-17 was landed in this valley between quite high hills with an approach only a bush pilot would have taken on. There is obviously no primary rock, the whole terrain is subdued in a thick blanket of airfall regolith. Some of the polylithological breccia found has some anorthosite so the higher hills may be anorthosite cored. The site was chosen because of the possibility of volcanic cinder cones occuring there. The pre-landing pix must have been very bad. The prominent hill on the left appears to be a block tilted left. Many ground pix show horizontal banding on the north facing (right) slope also seen here. The Mare basalts may have flowed between these hills, at any rate basalts were found on the floor of the valley in the young Shorty Crater but the well known large boulder Split Rock is a multilithologic impactite. Michael Light terms the ejecta from the Camelot Crater "basalts" but his rescanned pic 93 shows large patches of white. Basalt it ain't, possibly another polylithologic breccia. Ground View >>This is near the Apollo-17 site on the ground, showing Shorty Crater Those may be rocks but one could not swear to it in court, they could be green cheese. The samples returned are breccia though so far we have not been able to run any list of sample collection sites to earth. But are they impactites formed by the impact which formed the small crater or are they from an older larger impact and merely displaced? Probably the latter. The regolith is obviously thick but I do not think any digging was done and I do not think anyone went down into the crater. So we do not learn so much from Apollo-17. <<Apollo-16 landing site. This is a flat located in the more subdued highlands SW of the Apollo 11 site on Tranquillitatus. The odd looking structures are finger prints. Thick regolith covers the area so no primary rocks could be obtained. The samples were entirely anorthosite-troctolite polymict breccias with shock-melted veins. So the non crater rim-like hills are presumably anorthosite underneath airfall material. The crater below right of Lindsey appears to have a basaltic floor but this was not visited in spite of what appears to be a pass through the rim. There is no scale but it may be 50 - 100 km away. A small number of basaltic breccia samples may be local or may have been thrown from a great distance. Lacking illustrations showing good local detail for some of the landing sites, putting together the results of the Apollo landings is difficult but we shall persist. It would seem impossible that such high Mg rocks as the troctolites could be found near the surface and they must be ejecta of an older major impact. This site lies in the hills immediately east of the Mare Imbrium lava lake. Again we see subdued hills blanketed by a heavy regolith cover, as we would expect being close to a major Mare. The site was chosen largey because of the proximity to the Hadley Rille, a winding rock crevasse, either a fault rent or it has been suggested, a collapsed lava tube. It was claimed that layering in the basalt could be seen on the walls of the rille, but most photos show no primary rock in view and only a scree of basaltic chips of unknown origin. Samples returned are ferro-basalts, anorthosites and picrites. Hadley Rille is 80 miles long, a mile across and 1000ft deep. Rilles usually occur circumferentially to the maria and along the periphery of crater lava lakes. They are very similar to the boundary fracture formed by contraction in Hawaiian pit craters. 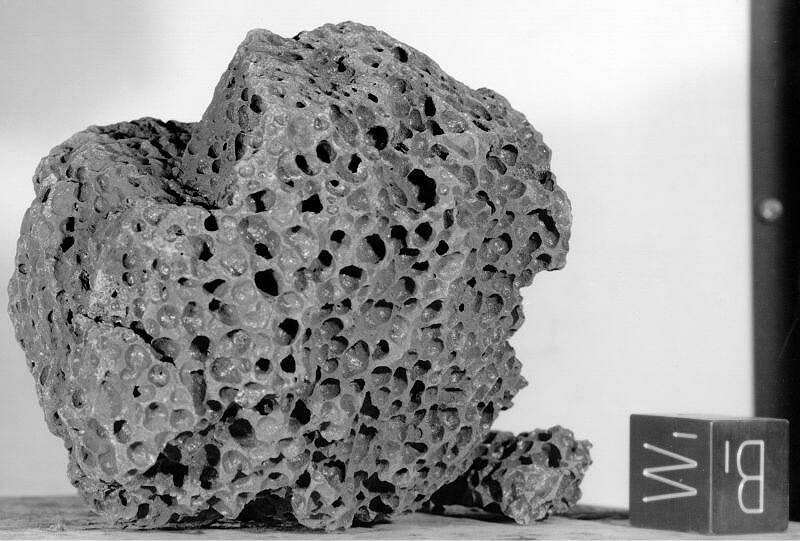 This Apollo-15 basaltic sample as displayed by NASA is given no description, but is strange in being vesicular, which implies the presense of gases or water vapour. Lunar rocks in general are unusual in their complete lack of alteration and zero water-gas content. Crushing such a sample should release gas. 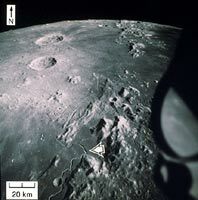 This is the celebrated Fra Mauro Site, selected as being in the slightly hillier country compared to the very flat Maria located Apollo 11 and 12 sites. It appears to be a part of the thick regolith-surround of the Mare Imbrium impact. The terrain is undulating but not hilly or mountainous though optimistically termed "Highlands". The samples are low-Ti basalt probably unrelated to the underlying Oceanus Procellarum. The Apollo-12 site is located on the Oceanus Procellarum south of Copernicus. As probably the oldest of the Maria, it is flat with a thick regolith blanket. The presense of metallic iron in the ferro-basalts may suggest impact of an iron meteorite. 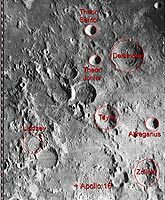 The first Apollo landing was on the Mare Traquillitatus near the southwestern edge. High Titanium basalts are probably local. Only a short time was spent on the ground and the earlier landings did not carry a vehicle. The scenery is quite flat but with a thick regolith airfall blanket of unknown thickness. Timocharis Crater >> occurs on Mare Imbrium. It shows a number of features including successive internal slump scarps, rayed ejecta, a massive build up of the ejecta blanket near the crater apparently thinning rapidly with distance and causing lack of definition near the crater lip. A great many younger but much smaller impact craterlets are seen. Photo from "Full Moon" by Michael Light. Some glassy regolithic material has quite high K, Rb, REE and P hence the name. When we look at tektites formed on earth they are always glasses of silicic or rhyolitic material, so impact melt may have a composition skewed towards the lower melting point fractions. Are KREEP the shock-melted products of shock-melted products of shock-melts? With heavy gloves the astronauts could not adjust focus so cameras were set to infinity. However, close ups taken inside the lunar lander are also not sharp. The orbital surveyor pix were taken in pre-digital camera days and film was developed actually on board and digitised and relayed by radio. And digitising techniques were not good then. However some bitter critics state that NASA was unable to re-align a mal-adjusted scanner. There is an ongoing program of rescanning in place and some show an improvement, some do not. Michael Light who wrote the book "Full Moon" says that on return film was copied once and locked away. Pix releases are copies of copies of, in some case copies. He was able to get about 100 of the original films released and rescanned them. Some of his pix are the best on record, some however are still of indifferent quality. Lack of atmosphere seems to give very black shadow and bleached highlights. It would seem a very soft film is needed. Digital cameras are more tolerant of a wide range of light levels. The regolith blanket also subdues all sharp edges. it is though a few million tons of cement had been dumped on the terrain. It would seem that the most urgent need is not to put a man on Mars or build a Lunar space station but to get some decent close up digital pix of the lunar surface. There are almost no close up pix taken of rocks or soils, and even some of the better ones are misidentified. Eg in fig 93 Michael Light shows some rocks with prominent white patches which he terms "basalt" from Apollo 17. It looks like a polymict breccia. What they really are is not certain at this point. The Chemistry of the Lunar Rocks. In general the rocks are basaltic with flat or negative slope REE and normalised patterns, and are all very depleted in volatiles and volatile elements. H2O and CO2 are completely lacking, and Na, K, Rb, are always very low, while REE are relatively high especially in the lunar "Soils" or glass droplets formed by impact melting. Many (if not all) of the samples collected are impactites and breccias, basalts and anorthosites which have been partially remelted by shock impact of meteorites. Apollo 11 High Ti basalts of 9-12% TiO2 for which we have no terrestrial equivilents as fine-grained basalts, but ilmenite-magnetite accumulations of similar composition are found in complexes such as the Bushveld in South Africa. Apollo 12 Ferrobasalt to picrite, with 5.75 to 16% MgO. Some metallic iron is present. Apollo 15 Ferro-basalts of 19-22% FeO. The anorthosite-troctolites are rather similar to those from the isle of Rhum. One is inclined to speculate (as Dr Ross Taylor did) that a quiescent period allowed a largely molten planet to form an enormous closed layered intrusion or intrusions of which the roof was later broken and dispersed by meteorite impact, the low gravity, lack of air, and impact melting allowed the escape of the more volatile elements. However, a greater density of sampling might completely change this viewpoint. The high K, Rb, Si granophyric fractions may not have escaped lunar gravity, but simply not been sampled yet. 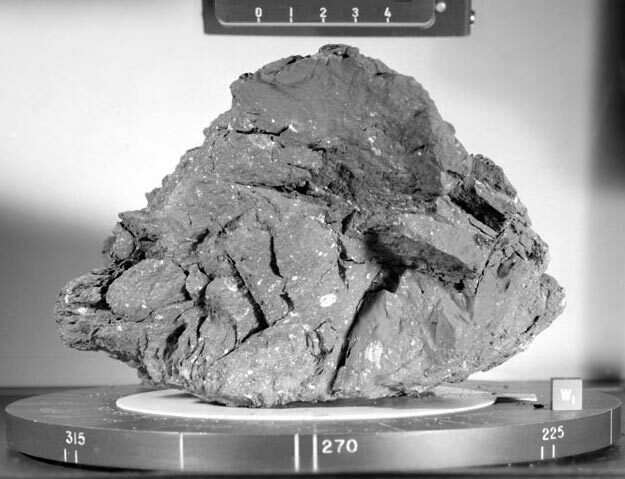 Most lunar rocks, including the ferrobasalts (except a few in Apollo 15b) exhibit a negative europium anomaly. This seems to argue the presence somewhere of a sodic feldspar fraction as well as granophyric and peridotite rocks. On the other hand, shock melting may produce some chemical oddities we do not yet understand . One also has to ask, why did such a layered structure not form in the earth at the same time. + = Apollo 17 troctolite - anorthosite. x = Apollo 15 associated Maria Basalt. (Most anorthosite blocks are shot through with shock-melted dark glass veins). * = Apollo 12 ferro basalt to picrite. o = Apollo 15 ferro-basalts. The two distinct series, the troctolite-anorthosites and the maria basalts, are bridged by some of the lunar "soils" obviously impactite mixtures. All Lunar rocks have similar fingerprints quite unlike any Terrestrial rock. Typically the REE, Ba, h, U and the Zr are high while Rb, K, P, Sr, Na are very low. The high REE so-called "KREEP" rocks are not enriched in Rb, K or P relative to the REE The high KREEP samples typically have about 80 ppm La compared to a maximum of 27 maximum for ORB glasses, though ORB whole rocks may be much higher. The diagrams below are ordered in sequence of increasing KREEP enrichment. Press F-11 to bring diagrams up full screen size. Apollo 12. The most basic or NMORBish of the "basalts". Note high Ti and the fact that on an REE diagram a negative Eu aomaly is present so we can assume these have already undergone plag fractionation. Apollo 17 Shocked Breccias. These recent data by Marc Norman are much more clearly defined. Note very high Th. The low Ti and high LILE suggests these are post TiMt removal yest TiO2 increases along with REE! The Sm/Eu ratio increases from 6.9 to 9.7 even while Al2O3 remains near 16-18%. FeOT is constant near 8%, MgO delines slightly from 11 to 9% while the LILE double. Apollo 15b. Selected higher KREEP samples. These are old data with many gaps but reasonable accuracy. These are slightly more KREEP enriched than Apollo-17. A single recent sample from Apollo-15b (15386) by Neal & Kramer,(2005). Again we see very high Th,U. At 10 -20 times EMORB and about x 400 chondrite, there are still even more enirched samples known. A Lunar meteorite from Saudi Arabia, SaU 169 has LREE of almost x 800 chondrite.but we have not been able to obtain a copy of the data. REE diagram for Apollo 17 basalt breccas showing prominent Eu anomaly. The Sm/Eu increase from 6.9 to 9.6 with apparent fractionation. Some KREEP rocks are mainly pyroxene-plagioclase with OPX progressively becoming pigeonite (up to 1 cm diam) with no cpx , (Steele etal, 1972) and no olivine (in 15386). It is possible that a pigeonite-plag cumulate might have about the same Al, MgO Fe, content as an evolved melt and be able to elevate he REE with the ME remaining about constant. 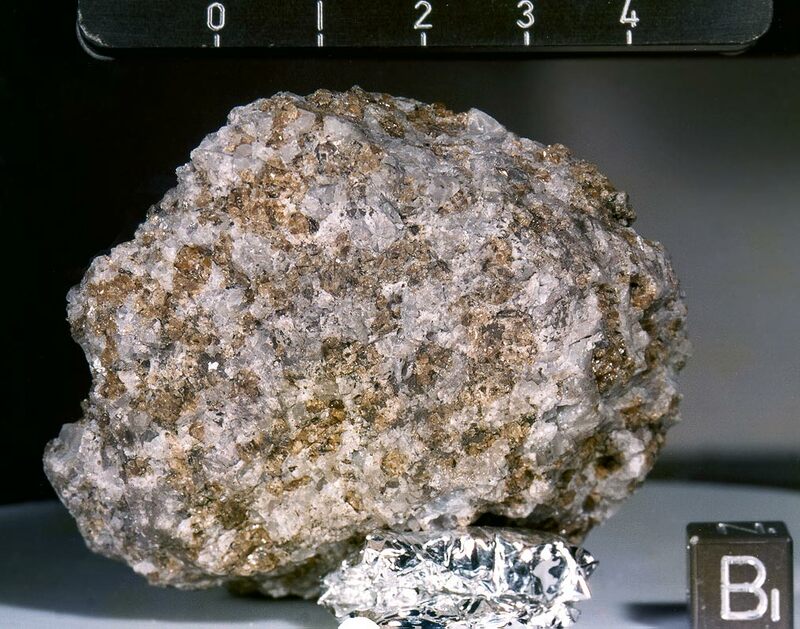 Otherwise, the evolution of the Lunar rocks is extremely puzzling. Apollo 16 anorthosite. Again we have KREEP enriched sample present. REE diagram fro Apollo 17 basalts showing Eu anomaly. Though the heavier REE are quite enriched, the negative slope is probably real, not due to shock-melting loss of the light REE, as they agree with the slopes of other diagrams.Compare with Apoll-17 breccias above. On Earth we would call it a plagioclase-fractionated evolved NMORB. REE diagram of some lunar soils plus the Fra Mauro Reference suite which includes some soils. Note enrichment in REE overall and persistence of -ve Eu. Light REE relatively enriched, so perhaps Mare basalts HAVE lost some light REE. REE from a selection of Lunar Mare Basalts. Data from S.R. Taylor, "Lunar Science". These LOOK like a related series of fractionated basalts with a parent between EMORB and NMORB, with a progressively developing Eu anomaly indicating plag fractionation. Zr/Nb diagram for Apollo 15B Low-Ti basalt - ferrobasalt. Note Apollo 15 samples are less depleted in LILE (Ba, Th, U, Nb, La, Ce) than the EPR. Tholeiitic terrestrial islands such as Alcedo, Galapagos Is, are somewhat more enriched. This close relationship of Lunar and MORB rocks holds also for Ce/La = 2.8, La/Sm = 2.1, La/Lu = 22, Zr/Nb = 15, Zr/Y = 4.3, Zr/La = 15, Th/U = 3.5, etc, so we can only conclude that the HFSE and Ba, Th, U, Nb are not affected to any degree by shock melting and that lunar basalts lie between N-Morb and tholeiitic OIB's in compositions. K/Rb retains a value of 425, so it appears these two elements are lost in equal amount. The EPR, west of Galapagos Is, (Regelous, et al, 1999) for comparison. Note the marked comparative loss in the lunar samples of K, Rb, (Cs?) as well as Cu, Zn and all volatiles with lesser loss of Sr, due possibly to shock melting and intense heat but perhaps more likely due to their very low levels in parental chondrite material. The original composition of lunar basalts must have compared closely with modern terrestrial NMORB's. Chondrites are similarly low in K group elements. The Apollo-16 samples range from olivine-rich troctolites on the right to pure anorthosites on the left. As the sample are randomly picked up impactites and breccias we do not know to what degree the good correlation seen is artificial. The anorthosites are unusually calcic, Fe, Ti, P, diminish as the amount of Al increases with increasing feldspar. One or two odd samples of low Al are present. In general they resemble troctolite-anorthosites of the Mull Intrusion in the British Tertiary. Unfortunately few trace elements were done for Apollo-16 and no REE are available. There appears to be a similarity between the fingerprint for the eucrites and the Lunar mare asalts. Howeve the eurcte data is very patchy, for example of almost 1000 partial analyses no one sample has been analysed for both K and Rb. Only a handfull have been done for both Rb and Nb, so we cnnot construct a reasonable finger print., but the same characteristics of very low Rb, K (and Na) with high Ba, Th, U appear to be present. A great deal more data is theoretically available but scattered widely through the literature over the last 30 y ears. No attempt has been made to put it into any database so much has been effectively lost. Many thanks are extended to NASA for providing free, the relevant Lunar Catalogues. The above interpretations I should add, are entirely my own.